ONE OWNER GRAND PRIX WHITE SPEEDSTER! 20,000 original milesOne of 823 delivered to the USNon-restored original conditionNumbers matching 3.2L Engine Optional Limited Slip DifferentialFull documentation including all stamped service records Original window sticker and copy of original bill of saleOriginal owners manual, car cover, tools and keysFactory Fuchs wheelsOptional Air conditioning, speed control, CD player and amplifierThis is the start of selling a collection of my cars. 1 of 75 classic cars that I own. I am willing to take serious offers on this car. Please email if you have any interest or questions on the car. Thank you for looking!! 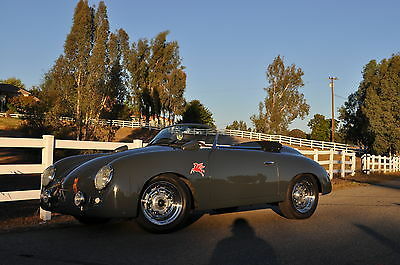 1957 356 Outlaw Speedster Replica 1957 356 Speedster replica built by Vintage Speedsters. You'll be ready to go for the Spring 2016 season. *High resolution photos below, just scroll down. * Email Troy at vanatic99@yahoo.com This Speedster comes with a classic slate grey exterior, but add the red wine leather seats, dash and door panels and you have a color combination that is simply stunning! The Nardi steering wheel, the Nardi wood shift knob and the black carpet give the interior of my car the iconic and timeless look that Ferdinand Porsche envisioned for these cars some 60 years ago, but the exterior is what makes this car so special. If you have heard the term "Outlaw" used when referring to some Porsches, this what they were talking about. 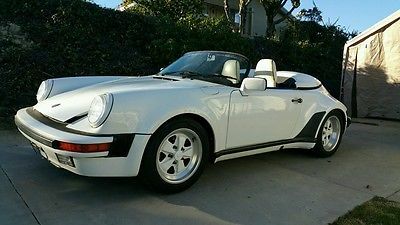 This is the epitome of a Porsche Speedster Outlaw: No side trim GT mirrors Wide 5 wheels with extended studs No bumpers (but the original bumpers are included in the sale) No hood handle Leather hood straps Marchal driving lights Louvered deck lid Bee hive tail lights Mobile Pegasus emblems on both sides Mesh headlight stone guards If you're looking for fun and excitement and you like the idea of "the wind in your hair," but think a motorcycle is too dangerous or, you already have a motorcycle, but your significant other is tired of riding on the back and you want something that is just as exciting, but more comfortable and way more classy, then this car is for you! More fun and much more comfortable than a motorcycle, costs about the same as a Harley, you can't fall off of it and there is NO HELMET REQUIRED!!! This Speedster has only been driven 4,275 actual miles since it was built and the original engine was replaced with a BIG 2110cc tuned by the legendary Pat Downs of CB Performance. The paint, leather interior, top and side curtains are all in excellent, like new condition. The chrome Wide Five wheels with Pirelli P4 tires, extended studs and disk skins are simply spectacular. This incredible Speedster is built on a 1968 VW pan and it has current registration in California as a 1968 VW (good until March, 2016) and is exempt from smog certification requirements in California and many other states. The Porsche and Carrera script on the rear, the Porsche script on the dash, the USA and Stuttgart badges on the grill and the genuine Tenex fasteners (no snaps) add the finishing touches. When comparing this Speedster with Speedsters from other manufacturers, pay very close attention to the quality of the build. Check that the doors, hood and trunk all fit smoothly and are aligned properly, with no gaps. This car also comes with super cool, custom made, top down "Cruzin Windows" that almost nobody else has, because I make them myself! ("CruZin Windows" are also available separately on eBay) The engine is a big 2110cc Type 1 VW with dual 44IDF Weber carburetors, an A1 Sidewinder header and many more CB Performance upgrades. The Speedster has current registration as a 1968 VW in California and has 4,200 miles on the car with: Slate Grey exterior Interior is genuine leather, red wine bucket seats, door panels and dash trim Black top with matching side curtains Black carpet in both the interior and trunk 3" Crow racing seat belts Nardi steering wheel Porsche crested horn button Nardi shift knob Coco mats Tenex chrome fasteners on top and both tonneau covers Custom made "CruZin Windows" for top-down cruising Fire extinguisher under dash Porsche script on the dash Porsche and Carrera script on the rear Porsche script on the front Mobil Pegasus emblems on both sides Reutter badge on right front fender Retro "Fast Cheap and Out of Control" air freshener Stuttgart, SOC and USA badges on the engine grill Louvered engine deck lid Engine deck lid lock pin and quick release Bee Hive tail lights Leather hood straps Mesh headlight stone guards Marchal driving lights Front and rear bumpers deleted (but included with sale) Adjustable Day/Night rear view mirror Dual GT side mirrors 2110cc Type 1 VW engine built by D&J Auto (Tuned by Pat Downs) External thermostatically controlled oil cooler Spin on oil filter O-ring sealed high capacity oil sump 4 speed manual 3:88 "Freeway Flyer" transmission (perfect for cruising those country roads and powering through the twisties) Dual 44 IDF Weber carburetors (installed and tuned by Pat Downs) CB Performance Magnaspark digital distributor, ignition system with software and interface cables (installed and programed by Pat Downs) Magnaspark II Dry Cell coil Super Mag 8.5mm plug wire set A1 Sidewinder header and MagnaFlow muffler Front disc brakes Wide 5 chrome wheels Drum skins front and rear Extended wheel studs Perelli P4 tires Adjustable front suspension Adjustable rear spring plates Rear Camber compensator Porsche crested valve stem caps Half tonneau cover Full tonneau cover Full car cover *Original bumpers are included in the sale* This Speedster is my personal car, so I have spared no expense to make it the COOLEST Speedster in California. ***Click the links below the pictures to watch the videos. *** When the videos begin, click the little gear in the lower right and select 1080p or 720p for HD quality. 22 Minute Foothill Cruise On 10/24/15 https://youtu.be/HWFBo3xVlCg https://youtu.be/Me5_-3tNH5Q http://67.181.190.107/SLO_2014.mp4 http://youtu.be/RtrxB_moImQ All of the photos below were taken on 10/29/15 and are also available at this link. http://67.181.190.107/SlateGreyOutlaw.htm Ok, now that you have read all the details about this car and seen all the pictures, it's all up to you. I challenge you to compare this Speedster to any other Speedster currently listed on eBay or anywhere else for that matter. This is by far the nicest Speedster out there. None of them come anywhere near close to my car! As soon as someone who knows what they are looking at sees this car it will be sold. Trust me on this one, if you snooze, you're going to lose! * PLEASE READ EVERYTHING BELOW* $1,000 NONREFUNDABLE PAYPAL DEPOSIT WITHIN 24 HOURS OF PURCHASE . PAYMENT IN FULL IS DUE WITHIN 7 DAYS OF CLOSE OF PURCHASE VIA WIRE TRANSFER OR CASH ONLY. NO EXCEPTIONS THE TIME TO INSPECT THE CAR IS BEFORE YOU PURCHASE IT, NOT AFTER!!! I know it can be nerve wracking to buy a car sight unseen and wire cash to someone you don't know. I have sold several other beautiful Vintage and JPS Speedsters on eBay and received 100% positive feedback for my eBay transactions. You can bid with confidence. ***IMPORTANT PLEASE READ CAREFULLY*** If you have less than 5 feedbacks, please contact me before purchasing. I will need to verify that you are a serious buyer. Thank you. Mike Pardini (925) 330-3475 2555 North Main Street Walnut Creek California 94597 ? ? ? ? 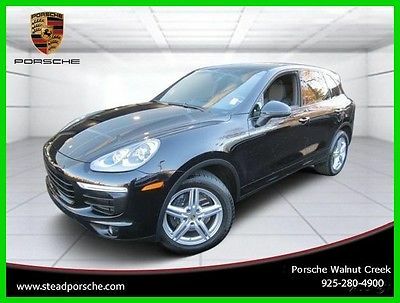 2016 Porsche Cayenne Vehicle Information VIN: WP1AA2A23GKA15151 Stock: UP2275 Mileage: 4,418 Color: Jet Black Metallic Trans: 8-Speed Automatic Engine: V6 MPG: 19 City / 24 Highway Drivetrain: AWD ? ? ? ? 1 of 15 ? View Large Images ? ? 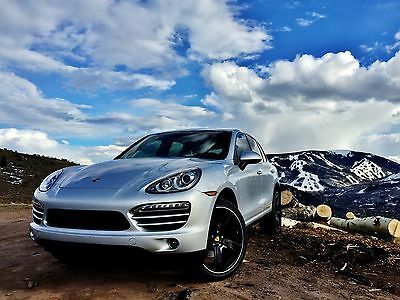 Description 2016 Porsche Cayenne. This vehicle has Jet Black Metallic exterior and Standard interior in Black with only 4,418 miles. 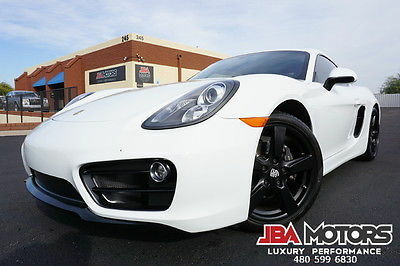 This vehicle is a Porsche Approved Certified Pre-owned Vehicle, meaning it will deliver your dream precisely as it was intended. The grade, “Porsche Approved”, is given to pre-owned Porsche vehicles that meet the quality standards of the Porsche brand. This is how you can broaden your choice between a new and a pre-owned vehicle - by one additional option: a Porsche Approved vehicle. Buying a Porsche Approved Certified Pre-owned Vehicle means that your dream will remain unbroken. What does this entail? In term, the CPO Limited Warranty is a total of 2 years or up to 50,000 miles from the mileage on the odometer at the time of retail used delivery not to exceed a total of 100,000 miles/160,000 KM. The vehicle meets the Porsche preparation standards The certification vehicle has been inspected in compliance with our 111-point checklist All work has been performed by Porsche trained technicians Only Genuine Porsche parts have been used This vehicle is immaculate inside and out and very-well equipped with option list below: Trailer hitch without tow ball Wheel Center Caps with Colored Porsche Crest Jet Black Metallic Electric Slide/Tilt Moonroof Seat Heating (Front) Seat Ventilation (Front) BOSEÂ® Surround Sound System BASE - Cayenne 19" Cayenne Design II Wheels 8-speed Tiptronic S Standard Interior in Black Power Seats (14-way) with Memory Package Premium Package Infotainment Package w/ HD Radio Exterior Package in Black (High-Gloss) Contact Mike Pardini directly at (925)330-3475 if you have any interest in this vehicle. Certified Pre-Owned Porsche Ask Your Dealer For Details View Details Video Play Video ?Credit Application ?Directions to Dealer ?Contact Us Options and Standard Features Options ? 4 Wheel Disc Brakes ? 5 Passenger Seating ? Additional Power Outlet(S) ? Air Bag - Driver ? Air Bag - Passenger ? Air Bag - Side ? Air Bag On/Off Switch - Passenger ? Air Bags - Head ? Air Conditioning ? Air Conditioning - Rear ? All Wheel Drive ? Am/Fm Stereo ? Anti-Lock Brakes ? Arm Rest - Rear ? Audio Input Jack ? Bi-Xenon Headlights ? Blue Tooth Communications ? Bose Sound System ? Brakes-Abs-4 Wheel ? Bucket Seats ? Built-In Garage Door Opener ? Cd Player ? Center Arm Rest ? Certified Vehicle ? Child Safety Locks ? Child Seat Anchors ? Climate Control - Auto ? Climate Control - Dual ? Clock ? Compass ? Console ? Cruise Control ? Cup Holders ? Daytime Running Lights ? Driver Memory Seat ? Engine Immobilizer/Vehicle Anti-Theft System ? Floor Mats-Front ? Fog Lights ? Headlamps - Led ? Headlights-Auto-Off ? Heated Front Seats ? Heated Side Mirrors ? Heater - Rear ? Leather Seats ? Mirrors-Fold-Away Power ? Mirrors-Pwr Driver ? Mirrors-Vanity-Driver Illuminated ? Mirrors-Vanity-Passenger Illuminated ? Mp3 Sound System ? Navigation System ? Outside Temperature Display ? Paddle Shifter ? Park Assist - Front ? Park Assist/Back Up Camera And Monitor ? Passenger Memory Seat ? Power Brakes ? Power Door Locks ? Power Driver Seat ? Power Lift Gate ? Power Passenger Seat ? Power Steering ? Power Windows W One Touch ? Reading Lamps-Front ? Reading Lamps-Rear ? Rear Defrost ? Rear Wiper ? Remote Keyless Entry ? Roof-Sun/Moon ? Security System ? Spoiler ? Stability Control System ? Steering Wheel Stereo Controls ? Steering Wheel-Leather Wrapped ? Steering-Power Tilt And Telescopic ? Tachometer ? Telephone-Hands-Free Wireless Connection ? Tinted Glass ? Tire-Pressure Monitoring System ? Towing Package ? Traction Control ? Trip Odometer ? Usb Audio Interface ? Warranty ? Wheels - Aluminum 19 ? Wipers-Intermittent Front And Rear ? Wipers-Rain Sensing ? Wipers-Variable Speed Intermittent ? 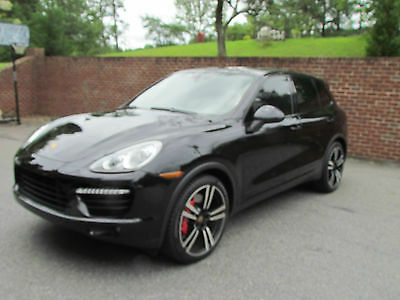 2016 Porsche Cayenne Basic Information Stock Number: UP2275 VIN Number: WP1AA2A23GKA15151 Style Name: All-Wheel Drive Make: Porsche Model: Cayenne Model Year: 2016 Vehicle Type: SUV Vehicle Trim: AWD 4Dr Interior Color: Black Exterior Color: Jet Black Metallic Body Type: SUV Warranty Porsche Certified With 100,000 Mile/6-Year Warranty Condition Used; In Pristine Condition Inside And Out Engine MPG Automatic City: 19 MPG Automatic Highway: 24 Engine Description: V6 Fuel Type: Gas Fuel Induction: Direct Gasoline Injection Valves Per Cylinder: 4 Aspiration: Normal DriveTrain 4WD Type: Full-Time Descent Control: Hill Descent Control Driven Wheels: All-Wheel Drive Locking Hubs: Permanent Transmission: 8-Speed Automatic Wheels Rims: Silver Aluminum Wheels Spare Rim Type: Steel Drive Train Type: AWD Suspension Independent Suspension: Four-Wheel Stabilizer Bar: Front And Rear Instrumentation Clock External Temp Low Fuel Level Tachometer Trip Computer Roof and Glass Front Wipers: Variable Intermittent Privacy Glass: Deep Rear Defogger Rear Wiper: Fixed Interval In Car Entertainment Antenna Type: Concealed Audio System: AM/FM/HD/Satellite-Prep Speakers: 10 Seats Drivers Height: Power Drivers Power: 8 Passenger Height: Power Passenger Power: 8 Seating Capacity: 5 Front Seat Type: Bucket Upholstery: Leather Center Armrest Folding: Flip Forward Cushion/Seatback Convenience Center Console: Full With Covered Storage Cruise Control Cupholders: Front And Rear Door Pockets: Driver, Passenger And Rear Overhead Console: Mini Power Outlets: 5 Remote Trunk Release: Power Seatback Storage: 2 Steering Adjustment: Tilt And Telescopic Steering Power: Power Steering Universal Remote Transmitter Power Mirrors: Power Remote Power Retractable Mirrors Power Door Locks Windows: Power Windows Navigation System Comfort Air Conditioning: Automatic Air Filtration: Interior Air Filtration Trunk Lights: Cargo Area Light Center Console Trim: Metal-Look/Piano Black Dash Trim: Metal-Look/Piano Black Door Trim: Metal-Look/Piano Black Mats: Carpet Front And Rear Reading Lights: Front And Rear Shift Knob: Leather/Metal-Look Steering Wheel Trim: Leather/Metal-Look Vanity Mirrors: Dual Illuminated Vanity Mirrors Features Aux Transmission Cooler: Regular Duty Bumpers: Body-Colored Door Reinforcement: Side-Impact Door Beam Safety Turning Circle: 39 ABS: 4-Wheel Head Airbags: Curtain 1St And 2Nd Row Anti Theft System Brake Assist: Braking Assist Safety Locks: Manual Daytime Running Light Engine Immobilizer Headlights Auto Delay: Auto Delay Off Headlights Dusksensor: Dusk Sensing Front Headrests: Manual Adjustable Rear Headrests: 3 Rear Center Seatbelt: 3-Point Belt Safety Stability Control Driver And Passenger Airbag Side Airbag Stability Control Door Reinforcement: Side-Impact Door Beam Towing and Hauling Tie Downs: Cargo Tie Downs Doors Rear Door Type: Power Liftgate Side Door Type: Conventional Dimensions Front Head Room: 39.6 Inches Front Hip Room: 57.8 Inches Front Shoulder Room: 58.9 Inches Luggage Capacity: 24 Cu.Ft. Length: 191.1 Inches Width: 78.7 Inches Height: 67.4 Inches Wheelbase: 114.0 Inches Ground Clearance: 8.5 Inches Max Gross Vehicle Weight: 6,195 Lbs. Curb Weight: 4,488 Lbs. ? Apply Now Secure Credit Application Applying for a vehicle loan online is one of the quickest and easiest application methods. Our secure application is easy to complete, all you need are a few personal and employment details. Contact Porsche Walnut Creek 2555 North Main Street Walnut Creek California 94597 View Map Ask for:Mike Pardini Contact: ?Contact Us Primary Phone:(925) 330-3475 Hours Mon-Sat:09:00 AM-06:00 PM PST Sunday:Closed Message Terms Placing a Bid: Your bid constitutes a legally binding contract to purchase this vehicle. Please do not bid if you're not seriously interested or financially able to purchase this vehicle. 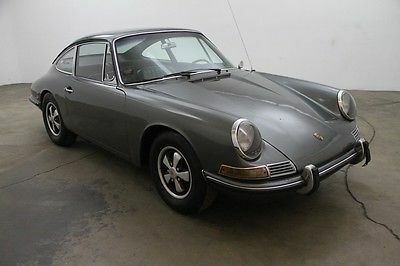 Please read eBay's User AgreementPorsche Walnut Creek reserves the right to, Obtain and verify the registered information of all users who bid on this auction. Cancel any and all bids at our discretion, or end the auction early if necessary.Bidders Age: You must be 18 years of age or older to Bid. Special eBay Bid Retraction Rules: Please read eBay's "Retracting a Bid" If you place a bid before the last 12-hour period of the auction: You may retract that bid before that last 12-hour period but only for exceptional circumstances. You will not be allowed to retract that bid during the last 12-hour period of the auction. If you place a bid during the last 12-hour period of the auction: You will be allowed to retract the bid for exceptional circumstances but only if you do so within one hour after placing the bid.Funds & Financing: For help in arranging for a Pre-Approved loan or for any questions please e-mail or phone Mike at(925) 330-3475 prior to bidding. Buyers Inspection: Porsche Walnut Creek has done our best to disclose all information known about this vehicle for auction. Porsche Walnut Creek welcomes a buyers inspection. If you plan to have a buyers inspection, please make sure you inspect the vehicle prior to the auction ending. Inspection fees if any are Buyers responsibility. Representations and Warranties made by seller: This vehicle is being sold "as is". Manufacturer's warranties may still apply. Extended warranty may be available, e-mail or phone Mike at (925) 330-3475 for details. No representations or warranties are made by seller, nor are any representations or warranties relied upon by bidders in making bids. Taxes and Registration fees: Out of state buyers are responsible for all state, county, city taxes and fees, as well as title service fees in the state that the vehicle will be registered. All taxes and fees must be paid in full in order for vehicle to be titled and registered. Title Information: Vehicles titles may be held by banks or lenders as collateral for loans. In many cases there is a delay in receiving the original instruments up to 21 days from the time we pay a vehicle off. While we usually have all titles in our possession at closing, there are occasions where we may be waiting for them to arrive. If payment is made by cashier's or personal checks we will hold all titles for 10 days or until funds have cleared. Shipping & Delivery: All shipping charges are buyer's responsibility. Porsche Walnut Creek will help with shipping arrangements but will not be responsible in any way for claims arising from shipping damage!Licensed Carriers are generally insured for $3,000,000.00. We assume no responsibility for damages incurred after the vehicle leaves our showroom. All shipping arrangements are provided by Porsche Walnut Creek as a courtesy. We are not affiliated with any carrier. Any claims or other communication regarding shipment of vehicles will be between you and the shipper, not with Porsche Walnut Creek . The amount of time it takes for delivery is dependent on the carrier, but is generally 7-14 days from the date the vehicle is picked up from our facility until it is delivered to your destination. Verify with the shipper for an Estimate Time of Arrival to be sure. Finalizing your Purchase: Porsche Walnut Creek will contact the successful high bidder by e-mail after the auction closes. Successful high bidder MUST communicate with Mike at Porsche Walnut Creek by e-mail or phone(925) 330-3475 within 24 hours of the auction ending to make arrangements to complete their transaction. If we cannot confirm your intention to buy or the sale is not completed within 5 days, we reserve the right to relist this vehicle or sell to any other qualified buyer. In order to secure bid on vehicle, Successful bidder (BUYER) must within 24 hours of bid closing send to Seller a Deposit in the amount of 10% by major credit card, cash in person or bank certified funds. Within 72 hours of bid closing, Buyer must send balance of funds by cash in person or bank certified funds to Seller. At time of sending initial deposit, Buyer MUST fax copy of their State issued valid Driver License. Furthermore, before said vehicle is released for shipment to Buyer, all other Sale related and title related paperwork must be signed and returned complete to Seller. Copyright © 2017 Auction123 - All rights reserved. - Disclaimer +- Auction123 (a service and listing/software company) and the Seller has done his/her best to disclose the equipment/condition of this vehicle/purchase. However, Auction123 disclaims any warranty as to the accuracy or to the working condition of the vehicle/equipment listed. The purchaser or prospective purchaser should verify with the Seller the accuracy of all the information listed within this ad. Selling a Vehicle? Create Professional Listings Fast and Easy. Click Here! Rich Yang (847) 778-5986 834 N Rush St Chicago Illinois 60611 ? ? ? ? 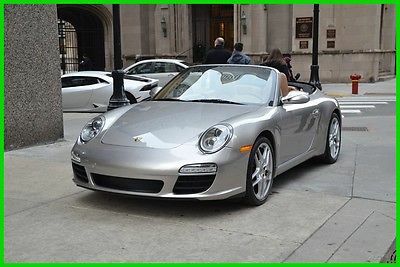 2011 Porsche 911 Carrera Vehicle Information VIN: WP0CA2A99BS740396 Stock: 40396 Mileage: 31,363 Color: Platinum Silver Metallic Trans: A Engine: H6 3.6L MPG: Drivetrain: RWD Contact Bentley Gold Coast 834 N Rush St Chicago Illinois 60611 View Map Ask for:Rich Yang Contact: ?Contact Us Primary Phone:(847) 778-5986 ? ? ?Credit Application ?Directions to Dealer ?Contact Us Options and Standard Features Options ? 2-Stage Unlocking Doors ? Abs: 4-Wheel ? Air Filtration: Active Charcoal ? Airbag Deactivation: Occupant Sensing Passenger ? Anti-Theft System: Alarm ? Braking Assist ? Cargo Area Light ? Center Console Trim: Leather ? Center Console: Front Console With Storage ? Child Seat Anchors: Latch System ? Convertible Rear Window: Glass ? Convertible Roof Wind Blocker ? Convertible Roof: Power ? Coolant ? Cruise Control ? Crumple Zones: Front ? Cupholders: Front ? Dash Trim: Leather ? Daytime Running Lights ? Door Handle Color: Body-Color ? Door Trim: Leather ? Driver Seat Manual Adjustments: 2 ? Driver Seat Power Adjustments: 4 ? Electronic Brakeforce Distribution ? Emergency Interior Trunk Release ? Engine Oil ? Exhaust Tip Color: Stainless-Steel ? Exhaust: Dual Tip ? External Temperature Display ? Floor Mat Material: Carpet ? Floor Mats: Front ? Front Air Conditioning Zones: Single ? Front Air Conditioning: Automatic Climate Control ? Front Airbags: Dual ? Front Brake Diameter: 13.0 ? Front Brake Type: Ventilated Disc ? Front Bumper Color: Body-Color ? Front Fog Lights ? Front Headrests: 2 ? Front Seat Type: Sport ? Front Shock Type: Gas ? Front Spring Type: Coil ? Front Stabilizer Bar ? Front Struts: Macpherson ? Front Suspension Classification: Independent ? Front Suspension Type: Lower Control Arms ? Front Wipers: Rain Sensing ? Gauge: Tachometer ? Headlights: Auto On/Off ? Heated Windshield Washer Jets ? In-Dash Cd: Mp3 Playback ? Limited Slip Differential: Center ? Low Fuel ? Mirror Color: Body-Color ? Multi-Function Remote: Keyless Entry ? One-Touch Windows: 2 ? Passenger Seat Manual Adjustments: 2 ? Passenger Seat Power Adjustments: 4 ? Power Door Locks ? Power Outlet(s): 12V Front ? Power Steering: Variable/Speed-Proportional ? Power Windows ? Radio Data System ? Radio: Am/Fm ? Reading Lights: Front ? Rear Brake Diameter: 13.0 ? Rear Brake Type: Ventilated Disc ? Rear Bumper Color: Body-Color ? Rear Fog Lights ? Rear Seat Folding: Split ? Rear Seat Type: Bucket ? Rear Shock Type: Gas ? Rear Spoiler ? Rear Spring Type: Coil ? Rear Stabilizer Bar ? Rear Suspension Classification: Independent ? Rear Suspension Type: Multi-Link ? Retained Accessory Power ? Seatbelt Force Limiters: Front ? Seatbelt Pretensioners: Front ? Shift Knob Trim: Alloy ? Side Airbags: Front ? Side Curtain Airbags: Front ? Side Mirror Adjustments: Power ? Side Mirrors: Heated ? Stability Control ? Steering Wheel Trim: Leather ? Steering Wheel: Tilt And Telescopic ? Storage: Door Pockets ? Tire Pressure Monitoring System ? Tire Type: Performance ? Total Speakers: 9 ? Traction Control ? Trip Computer ? Universal Remote Transmitter: Homelink - Garage Door Opener ? Upholstery: Leather ? Vanity Mirrors: Dual Illuminating ? Warnings And Reminders: Lamp Failure ? Watts: 235 ? Window Defogger: Rear Basic Information Stock Number: 40396 VIN Number: WP0CA2A99BS740396 Style Name: Cabriolet Carrera Make: Porsche Model: 911 Model Year: 2011 Vehicle Type: Convertible Vehicle Trim: Carrera Interior Color: Sand Beige Exterior Color: Platinum Silver Metallic Body Type: Convertible Engine Engine Description: H6 3.6L Fuel Type: Gas Fuel Induction: Direct Gasoline Injection Valves Per Cylinder: 4 Aspiration: Normal DriveTrain Driven Wheels: Rear-Wheel Transmission: A Wheels Rims: Silver Aluminum Drive Train Type: RWD Suspension Independent Suspension: Four-Wheel Stabilizer Bar: Front And Rear Instrumentation Clock External Temp Low Fuel Level Tachometer Trip Computer Roof and Glass Convertible Roof: Power Convertible Window: Glass Rear Window Front Wipers: Variable Intermittent Privacy Glass: Light Rear Defogger In Car Entertainment Antenna Type: Window Grid Audio System: AM/FM Stereo Speakers: 9 Seats Drivers Height: Manual Drivers Power: 2 Passenger Height: Manual Passenger Power: 2 Seating Capacity: 4 Front Seat Type: Bucket Upholstery: Leather Folding: Fold Forward Seatback Convenience Center Console: Full With Storage Cruise Control Cupholders: Front Door Pockets: Driver And Passenger Power Outlets: 2 Remote Trunk Release: Power Steering Adjustment: Tilt And Telescopic Steering Power: Speed-Proportional Power Steering Universal Remote Transmitter Power Mirrors: Power Remote Power Door Locks Windows: Power Windows Comfort Air Conditioning: Automatic Air Filtration: Interior Air Filtration Trunk Lights: Cargo Area Light Mats: Carpet Front Reading Lights: Front Shift Knob: Leather/Metal-Look Steering Wheel Trim: Leather/Metal-Look Vanity Mirrors: Dual Illuminated Vanity Mirrors Features Aux Engine Cooler: Regular Duty Aux Transmission Cooler: Regular Duty Bumpers: Body-Colored Door Reinforcement: Side-Impact Door Beam Safety Turning Circle: 34.8 ABS: 4-Wheel Head Airbags: Curtain 1St Row Anti Theft System Brake Assist: Braking Assist Daytime Running Light Engine Immobilizer Headlights Auto Delay: Auto Delay Off Front Headrests: Fixed Safety Stability Control Driver And Passenger Airbag: Cancellable Side Airbag Stability Control Door Reinforcement: Side-Impact Door Beam Dimensions Front Head Room: 38.0 Inches Front Hip Room: 53.4 Inches Front Shoulder Room: 51.7 Inches Front Leg Room: 41.6 Inches Rear Head Room: 31.5 Inches Luggage Capacity: 5 Cu.Ft. Length: 175.6 Inches Width: 71.2 Inches Height: 51.6 Inches Wheelbase: 92.5 Inches Curb Weight: 3,075 Lbs. ? Apply Now Secure Credit Application Applying for a vehicle loan online is one of the quickest and easiest application methods. Our secure application is easy to complete, all you need are a few personal and employment details. Terms Placing a Bid: Your bid constitutes a legally binding contract to purchase this vehicle. Please do not bid if you're not seriously interested or financially able to purchase this vehicle. Please read eBay's User AgreementBentley Gold Coast reserves the right to, Obtain and verify the registered information of all users who bid on this auction. Cancel any and all bids at our discretion, or end the auction early if necessary.Bidders Age: You must be 18 years of age or older to Bid. Special eBay Bid Retraction Rules: Please read eBay's "Retracting a Bid" If you place a bid before the last 12-hour period of the auction: You may retract that bid before that last 12-hour period but only for exceptional circumstances. You will not be allowed to retract that bid during the last 12-hour period of the auction. If you place a bid during the last 12-hour period of the auction: You will be allowed to retract the bid for exceptional circumstances but only if you do so within one hour after placing the bid.Funds & Financing: For help in arranging for a Pre-Approved loan or for any questions please e-mail or phone Rich at (847) 778-5986 prior to bidding. Buyers Inspection: Bentley Gold Coast has done our best to disclose all information known about this vehicle for auction. Bentley Gold Coast welcomes a buyers inspection. If you plan to have a buyers inspection, please make sure you inspect the vehicle prior to the auction ending. Inspection fees if any are Buyers responsibility. Representations and Warranties made by seller: This vehicle is being sold "as is". Manufacturer's warranties may still apply. Extended warranty may be available, e-mail or phone Rich at (847) 778-5986 for details. No representations or warranties are made by seller, nor are any representations or warranties relied upon by bidders in making bids. Taxes and Registration fees: Out of state buyers are responsible for all state, county, city taxes and fees, as well as title service fees in the state that the vehicle will be registered. All taxes and fees must be paid in full in order for vehicle to be titled and registered. Title Information: Vehicles titles may be held by banks or lenders as collateral for loans. In many cases there is a delay in receiving the original instruments up to 21 days from the time we pay a vehicle off. While we usually have all titles in our possession at closing, there are occasions where we may be waiting for them to arrive. If payment is made by cashier's or personal checks we will hold all titles for 10 days or until funds have cleared. Shipping & Delivery: All shipping charges are buyer's responsibility. Bentley Gold Coast will help with shipping arrangements but will not be responsible in any way for claims arising from shipping damage!Licensed Carriers are generally insured for $3,000,000.00. We assume no responsibility for damages incurred after the vehicle leaves our showroom. All shipping arrangements are provided by Bentley Gold Coast as a courtesy. We are not affiliated with any carrier. Any claims or other communication regarding shipment of vehicles will be between you and the shipper, not with Bentley Gold Coast. The amount of time it takes for delivery is dependent on the carrier, but is generally 7-14 days from the date the vehicle is picked up from our facility until it is delivered to your destination. Verify with the shipper for an Estimate Time of Arrival to be sure. Finalizing your Purchase: Bentley Gold Coast will contact the successful high bidder by e-mail after the auction closes. Successful high bidder MUST communicate with Rich at Bentley Gold Coast by e-mail or phone (847) 778-5986 within 24 hours of the auction ending to make arrangements to complete their transaction. If we cannot confirm your intention to buy or the sale is not completed within 5 days, we reserve the right to relist this vehicle or sell to any other qualified buyer. In order to secure bid on vehicle, Successful bidder (BUYER) must within 24 hours of bid closing send to Seller a Deposit in the amount of 10% by major credit card, cash in person or bank certified funds. Within 72 hours of bid closing, Buyer must send balance of funds by bank wire transfer, cash in person, bank certified funds to Seller. At time of sending initial deposit, Buyer MUST fax copy of their State issued valid Driver License. Furthermore, before said vehicle is released for shipment to Buyer, all other Sale related and title related paperwork must be signed and returned complete to Seller.Fees There are 3 other fees associated with the transaction. Doc fee $168.43 ,$30.00 out of state drive-away tag and $50 for UPS Overnight (to and from) for the docs. Copyright © 2017 Auction123 - All rights reserved. - Disclaimer +- Auction123 (a service and listing/software company) and the Seller has done his/her best to disclose the equipment/condition of this vehicle/purchase. However, Auction123 disclaims any warranty as to the accuracy or to the working condition of the vehicle/equipment listed. The purchaser or prospective purchaser should verify with the Seller the accuracy of all the information listed within this ad. Selling a Vehicle? Create Professional Listings Fast and Easy. Click Here! Olena Rudenko (970) 405-2033 834 N Rush St Chicago Illinois 60611 ? ? ? ? 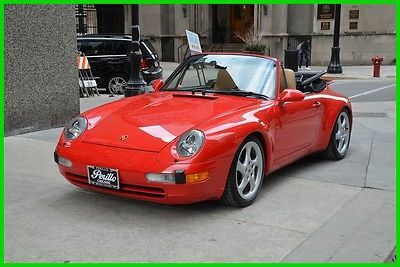 1997 Porsche 911 Carrera Vehicle Information VIN: WP0CA2997VS341186 Stock: L258AB Mileage: 21,623 Color: Red Trans: M Engine: H6 3.6L MPG: 17 City / 25 Highway Drivetrain: RWD Contact Bentley Gold Coast 834 N Rush St Chicago Illinois 60611 View Map Ask for:Olena Rudenko Contact: ?Contact Us Direct:(970) 405-2033 ? ? ?Credit Application ?Directions to Dealer ?Contact Us Options and Standard Features Options ? Abs: 4-Wheel ? Anti-Theft System: Alarm ? Cassette ? Cruise Control ? Exterior Entry Lights ? Front Air Conditioning ? Front Airbags: Dual ? Front Fog Lights ? Front Seat Type: Bucket ? Front Wipers: Intermittent ? Gauge: Tachometer ? Multi-Function Remote: Keyless Entry ? Power Brakes ? Power Door Locks ? Power Steering ? Power Windows ? Radio: Am/Fm ? Rear Spoiler ? Side Mirror Adjustments: Power ? Side Mirrors: Heated ? Steering Wheel Trim: Leather ? Tinted Glass ? Tire Type ? Upholstery: Leather ? Wheel Diameter: 16 Inch ? Wheels: Alloy Basic Information Stock Number: L258AB VIN Number: WP0CA2997VS341186 Style Name: Convertible Carrera Make: Porsche Model: 911 Model Year: 1997 Vehicle Type: Convertible Vehicle Trim: Carrera Interior Color: Beige Exterior Color: Red Body Type: Convertible Engine MPG Manual City: 17 MPG Manual Highway: 25 Engine Description: H6 3.6L Fuel Type: Gas Fuel Induction: Sequential MPI Valves Per Cylinder: 2 Aspiration: Normal DriveTrain Driven Wheels: Rear-Wheel Transmission: M Wheels Rims: Silver Alloy Wheels Spare Rim Type: Alloy Drive Train Type: RWD Suspension Independent Suspension: Four-Wheel Stabilizer Bar: Front And Rear Instrumentation Clock Low Fuel Level Tachometer Roof and Glass Convertible Roof: Power Privacy Glass: Light In Car Entertainment Antenna Type: Window Grid Audio System: AM/FM Stereo Speakers: 6 Seats Drivers Height: Power Drivers Power: 2 Passenger Height: Power Passenger Power: 2 Seating Capacity: 4 Front Seat Type: Bucket Upholstery: Leather Convenience Cruise Control Door Pockets: Driver And Passenger Power Outlets Remote Trunk Release: Keyfob Steering Power: Power Steering Power Mirrors: Power Remote Power Door Locks Windows: Power Windows Comfort Air Conditioning: Automatic Air Filtration: Interior Air Filtration Steering Wheel Trim: Leather Vanity Mirrors: Dual Vanity Mirrors Features Aux Engine Cooler: Regular Aux Transmission Cooler: Regular Bumpers: Body-Colored Safety Turning Circle: 38.6 ABS: 4-Wheel Anti Theft System Engine Immobilizer Front Headrests: Fixed Driver And Passenger Airbag Dimensions Front Head Room: 37.8 Front Leg Room: 43.3 Rear Head Room: 31.0 Rear Leg Room: 18.5 Luggage Capacity: 4 Maximum Seating: 4 Length: 167.7 Width: 68.3 Height: 51.8 Wheelbase: 89.4 Curb Weight: 3,064 ? Apply Now Secure Credit Application Applying for a vehicle loan online is one of the quickest and easiest application methods. Our secure application is easy to complete, all you need are a few personal and employment details. Terms Placing a Bid: Your bid constitutes a legally binding contract to purchase this vehicle. Please do not bid if you're not seriously interested or financially able to purchase this vehicle. Please read eBay's User AgreementBentley Gold Coast reserves the right to, Obtain and verify the registered information of all users who bid on this auction. Cancel any and all bids at our discretion, or end the auction early if necessary.Bidders Age: You must be 18 years of age or older to Bid. Special eBay Bid Retraction Rules: Please read eBay's "Retracting a Bid" If you place a bid before the last 12-hour period of the auction: You may retract that bid before that last 12-hour period but only for exceptional circumstances. You will not be allowed to retract that bid during the last 12-hour period of the auction. If you place a bid during the last 12-hour period of the auction: You will be allowed to retract the bid for exceptional circumstances but only if you do so within one hour after placing the bid.Funds & Financing: For help in arranging for a Pre-Approved loan or for any questions please e-mail or phone Olena at (970) 405-2033 prior to bidding. Buyers Inspection: Bentley Gold Coast has done our best to disclose all information known about this vehicle for auction. Bentley Gold Coast welcomes a buyers inspection. If you plan to have a buyers inspection, please make sure you inspect the vehicle prior to the auction ending. Inspection fees if any are Buyers responsibility. Representations and Warranties made by seller: This vehicle is being sold "as is". Manufacturer's warranties may still apply. Extended warranty may be available, e-mail or phone Olena at (970) 405-2033 for details. No representations or warranties are made by seller, nor are any representations or warranties relied upon by bidders in making bids. Taxes and Registration fees: Out of state buyers are responsible for all state, county, city taxes and fees, as well as title service fees in the state that the vehicle will be registered. All taxes and fees must be paid in full in order for vehicle to be titled and registered. Title Information: Vehicles titles may be held by banks or lenders as collateral for loans. In many cases there is a delay in receiving the original instruments up to 21 days from the time we pay a vehicle off. While we usually have all titles in our possession at closing, there are occasions where we may be waiting for them to arrive. If payment is made by cashier's or personal checks we will hold all titles for 10 days or until funds have cleared. Shipping & Delivery: All shipping charges are buyer's responsibility. Bentley Gold Coast will help with shipping arrangements but will not be responsible in any way for claims arising from shipping damage!Licensed Carriers are generally insured for $3,000,000.00. We assume no responsibility for damages incurred after the vehicle leaves our showroom. All shipping arrangements are provided by Bentley Gold Coast as a courtesy. We are not affiliated with any carrier. Any claims or other communication regarding shipment of vehicles will be between you and the shipper, not with Bentley Gold Coast. The amount of time it takes for delivery is dependent on the carrier, but is generally 7-14 days from the date the vehicle is picked up from our facility until it is delivered to your destination. Verify with the shipper for an Estimate Time of Arrival to be sure. Finalizing your Purchase: Bentley Gold Coast will contact the successful high bidder by e-mail after the auction closes. Successful high bidder MUST communicate with Olena at Bentley Gold Coast by e-mail or phone (970) 405-2033 within 24 hours of the auction ending to make arrangements to complete their transaction. If we cannot confirm your intention to buy or the sale is not completed within 5 days, we reserve the right to relist this vehicle or sell to any other qualified buyer. In order to secure bid on vehicle, Successful bidder (BUYER) must within 24 hours of bid closing send to Seller a Deposit in the amount of 10% by major credit card, cash in person or bank certified funds. Within 72 hours of bid closing, Buyer must send balance of funds by bank wire transfer, cash in person, bank certified funds to Seller. At time of sending initial deposit, Buyer MUST fax copy of their State issued valid Driver License. Furthermore, before said vehicle is released for shipment to Buyer, all other Sale related and title related paperwork must be signed and returned complete to Seller.Fees There are 3 other fees associated with the transaction. Doc fee $168.43 ,$30.00 out of state drive-away tag and $50 for UPS Overnight (to and from) for the docs. Copyright © 2017 Auction123 - All rights reserved. - Disclaimer +- Auction123 (a service and listing/software company) and the Seller has done his/her best to disclose the equipment/condition of this vehicle/purchase. However, Auction123 disclaims any warranty as to the accuracy or to the working condition of the vehicle/equipment listed. The purchaser or prospective purchaser should verify with the Seller the accuracy of all the information listed within this ad. Selling a Vehicle? Create Professional Listings Fast and Easy. Click Here! This is a CERTIFIED 2014 Porsche Cayenne Turbo in Jet Black Metallic with black leather interior. This SUV has 21" 911 Turbo ll wheels and the Premium Package Plus and PDLS Plus lighting. 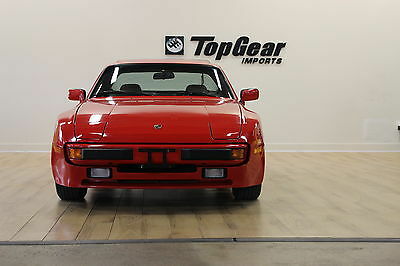 This certified Porsche comes with a 6 year-100,00 factory bumper to bumper warranty that will transfer to the new owner. This car is perfect, no paint work or accidents, it looks brand new. Check out the pictures for the mileage and window sticker as well as the certified folder for the warranty. 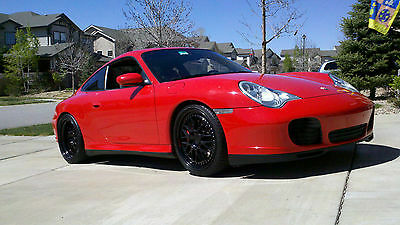 Also check my feedback and you will see that my cars that I have sold on Ebay are perfect. Just posted new pics of underneath, and new video of engine running today, April 18th. 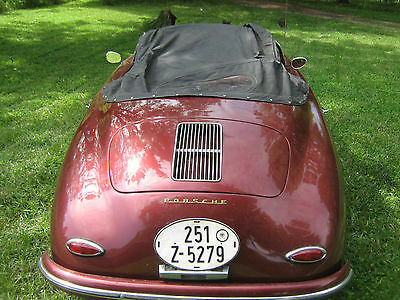 but as you can see, she runs fine... For sale today is a nice looking Porsche 356 Speedster in Bordeaux Red. 1550CC engine. We got the engine to fire up and did a little yard driving but we will include a couple extra SOLEX carbs to have her run smoother. Has front disk brakes. 4 speed shifts ok. A little play. Will need some bushings replaced. Car comes with its original convertible top and frame. extra top, tonneau cover+ tonneau cover, 2 tops, 2 sets of side windows . Fiberglass body is straight with no bends or breaks. All doors open and close like they should. Some rear floor work needed in isolated spots. (SEE NEW PICTURES FOR UNDERNEATH FLOORPAN). NOT BAD AT ALL UNDERNEATH, JUST ISOLATED SPOTS...Bonnet floor (where battery sits) is solid also....JUST LOWERED $1000 To sweeten the deal we are including a couple souvenir dataplates from a 1959 Mercedes 190 SL (which had to be crushed due to rust....see last picture, OUCH). We will include them to the next buyer free of charge. Sold as-is, how-is with right to inspect. No warranties expressed or implied. We welcome inspections. We can also help with shipping nationwide or overseas.......We have a contact with Central Dispatch who will NOT charge you a dispatcher fee to find a shipper. All youll pay is the straight shipping cost to shipper upon arrival. Dispatch fees can sometimes jack up a bid 30-40%. We will get you the lowest possible price Feel free to email with questions. One of the best prices out there for a replica classic. See our feedback and bid with confidence. We have been selling top end Euro cars for years with many happy customers. IF YOU'RE A PORSCHE 356 COLLECTOR OR A 190sl COLLECTOR DONT MISS OUT!